It’s probably not unusual that a story about maps begins with being lost. There I was, just before my interview at the Branner Library, campus map and GPS in hand, yet walking in endless circles that never came close to my destination. Apparently wayfinding on a campus can be tricky even for the well-prepared! Fortunately, Jane Ingalls came to the rescue on her bicycle. Once we were safely ensconced in the library, Jane began to tell me her plans. Both she and Julie Sweetkind-Singer had served on the executive board for WAML, and Jane is currently the Archivist. 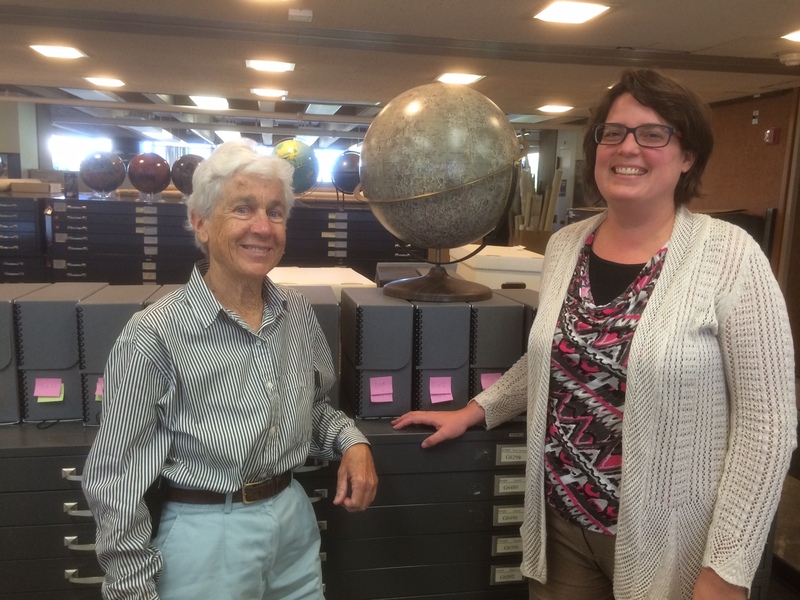 Since Jane was retiring at the end of August, it was their wish to organize, archive, and catalog the collection. As a MLIS student at San José State University, I was excited to take on the challenge. Archiving and maps: what could be more fun? M y first task was to sort through the many materials, dating as far back as 1959 (long before WAML was officially founded in 1967). Fortunately, WAML’s retention schedule is easily accessible online. I was able to create twelve different categories, or series, from the retention schedule: Meetings, Minutes, Membership, Constitution & Bylaws, Committees, Financial, Ballots & Questionnaires, Manuals, Correspondence, Media (Photographs, Negatives, CDs, etc. ), Miscellaneous, and Cartographic Users Advisory Council. As I sorted through the materials, I became familiar with names and events. I felt like I knew Stan Stevens, Larry Cruse, Phil Hoehn, Mary Larsgaard, Ron Whistance-Smith, and Mary Ansari. While I scanned the correspondence, I became acquainted with the group’s witty sense of humor and pervasive kindness. As I held a list of the attendee’s signatures, I wondered what it would have been like to be at the first planning meeting at UC Berkeley in November, 1966. I marveled at the photographs of the Branner Library after the 1989 Loma Prieta earthquake (photos by J.K. Herro, published in the Information Bulletin 22 ). And believe me, I was envious of all of the amazing meetings throughout the years: Hawaii (1992, 2002, 2012 – is there a pattern here? ); Alaska (2005); Yosemite (2013); and Vancouver (1975, 1989, 1995, 2006, 2011). The group once even ventured out of the western states and held a meeting in Washington D.C. (1998). After much help from the staff at Branner (especially Jane and Julie) and advice from Bill O’Hanlon (an archivist from Stanford’s Special Collections), I am proud to announce that the WAML collection is now organized in archival boxes which will be housed in Stanford’s Special Collections. The catalog record is accessible here: http://searchworks.stanford.edu/view/11412509; and the finding aid is available on the Online Archive of California (http://www.oac.cdlib.org/findaid/ark:/13030/c8rn3d8k/?query=waml – See “Additional collection guides” under the Table of Contents for the full finding aid). I spent my summer with WAML, and I invite all of you to spend some time with the history of such a vibrant organization.